liked body bar, and this just doesn't lather well at all. I'm kinda disappointed. But I managed to get a sample of a sea salt shampoo called BIG. The texture is just like sea salt mixed with liquid, but when I read the description at the store, I really wanted to try it out. 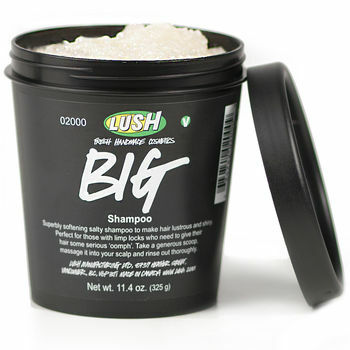 "Over half the base of Big shampoo is made with sea salt, giving massive volume to hair in need of a boost. Sea salt is also full of minerals and de-greases hair, removing dead skin cells and dirt without stripping natural oils for a fresh, squeaky clean feeling. " I've used it twice, and I like it. I don't think this is the kind of product that you should use on daily basis. The seal salt feels like a scrub for your hair. It cleans and gets rid of the gunk of products on your hair. And if you're like me and you sing at the shower, you'll taste the sea salt running down to your mouth from the shower. Lol. Every time I use this, my hair feels fresh and "squeaky clean". I dom't know if I'm gonna purchase the full size, but to be honest I have to be in a very happy mood to spend almost $30 for a shampoo. A girl's gotta do what a girl's gotta do. (Okay, honestly, I don't even know what that means).